August 2014 – ICELAND – Two earthquakes measuring over 5 in magnitude — the biggest yet — shook Iceland’s Bardarbunga volcano Sunday after the country issued an aviation red alert warning that an ash-emitting eruption may be imminent. 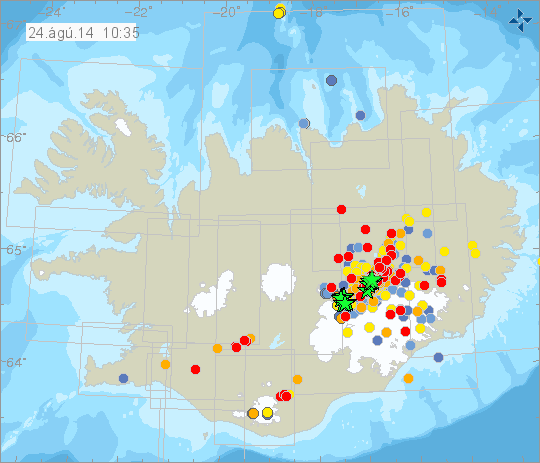 Iceland’s Meteorological Office recorded earthquakes of 5.3 and 5.1 in the early hours. It said there were no signs of an eruption. The volcano, underneath Iceland’s vast Vatnajokull glacier, has been rattled by thousands of small earthquakes over the past week. On Saturday scientists reported a small eruption under the ice, but it was not visible on the surface, and the Met Office later said it appeared to have stopped. Authorities have declared a no-fly zone of 100 nautical miles by 140 nautical miles (185 kilometers by 260 kilometers) around the epicenter as a precaution. Eruption has begun: Iceland’s Meteorological Office says a small lava eruption has begun underneath a glacier at the Bardarbunga volcano, the Associated Press reports. Seismic data showed ice melting beneath the Vatnajokull glacier, but it remains unclear if or when the eruption would break through the ice, sending ash and steam into the air. On Saturday, the agency changed the aviation alert for the volcano from orange to red, a move that signals an eruption is either imminent or already in progress. The country also put its Coast Guard on alert, Bloomberg reports. Earthquakes had been happening “so quickly that it is difficult for the seismologist to discern individual events,” a statement on the Met Office’s web site reads. As concern increased last week over a possible eruption of Iceland’s Bardarbunga volcano, authorities evacuated tourists from area. This entry was posted in Civilizations unraveling, Cracks, Dormant fault activation, Earth Changes, Earth Watch, Earth's core dynamics, Earthquake Omens?, High-risk potential hazard zone, Land fissures, Lava flow, Lithosphere collapse & fisssure, Magma Plume activity, Potential Earthchange hotspot, Prophecies referenced, Signs of Magnetic Field weakening, sinkholes, Subglacial flood event, Time - Event Acceleration, Volcano unrest, Volcano Watch. Bookmark the permalink. Just a quick question, is the name Baroabunga or Bardabunga? Or can it be both? At least it isn’t Eyjafjallajökull. But either way, this will not be good when it blows. Hi Irene, long time no see a blog, hope you doing well. By the way, there was an article on the internet that there has been reported magma movement and earth tremors in that volcano you fear that could blow. Yes, its true. Hi Dennis E. I’ve been keeping pretty busy tracking the weather, so I haven’t been blogging as much. Other than that, doing pretty good here. There has been some deflation in the caldera. In two words – Not Good. Hopefully this doesn’t continue. Look up “caldera collapse” to examine the consequences. A caldera collapse coupled with the enormous amount of glacial ice contained within could produce a huge eruption. This caldera produced the largest eruption of the Holocene – that is the present era starting as from 11,700 years ago. I did a phrase search “consequences of Caldera Collapse”. Ok so what would this eruption mean for the US? It’s not a supervolcano right? Should we expect effects from the ash here? I can’t believe how quickly events are happening now. No ash here in the US, cancelation of air traffic to Europe is a possibility depending on severity of an eruption. Keep updated at this guys site. 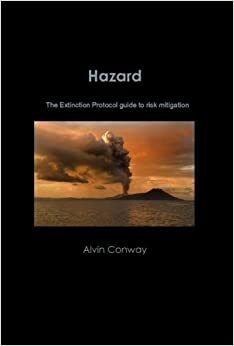 With all the recent activity of earthquakes and volcanos erupting are we gaining pace of a pole shift rather then climate change? 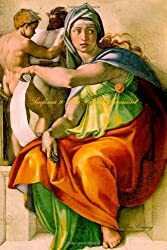 The earths core is magnetised molten iron ore and any movement from north to South could cause the earths mantel to buckle and move hence earthquakes and pressure release eg: this volcano about to erupt? In the short term, the longer this volcano does not erupt, the more serious the eruption will be. Look for a series of magnitude 5s, or greater.